Nothing is true, everything is permitted, and Assassin’s Creed 3 is rubbish. This was the general consensus held by many in the years following Assassin’s Creed 3’s release in 2012, which had the unfortunate luxury of being the first instalment in Ubisoft’s open world action series to follow up Ezio’s storyline, and the last before the dawn of next-generation hardware. With the added pressure of Ubisoft’s largest marketing campaign ever, in which trailer after trailer promised a grand adventure across America at the height of its revolution, it’s no surprise that the immediate reaction to the game was one of extreme disappointment. The soothing balm of time and hindsight, however, has allowed public opinion to soften somewhat on Assassin’s Creed 3, to the point where Ubisoft is even releasing a remaster of the game on PC, PS4, Xbox One, and Nintendo Switch later this month (free to owners of the Assassin’s Creed Odyssey season pass and bundled with Assassin’s Creed Liberation Remastered, the former PS Vita exclusive). 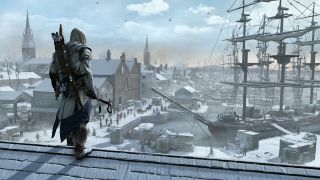 In light of the upcoming launch, I thought it’d be a good time to catch up with Assassin’s Creed 3’s original Creative Director, Alex Hutchinson, to look back on the game’s challenging development cycle, starting at the beginning. One of the “... opinions” players had about Assassin’s Creed 3 that Hutchinson refers to was regarding its controversial opening, in which you play as Connor’s father, Haytham Kenway, for a fair few hours before you eventually learn that he’s a Templar, the monastic cult that represent the creed’s long-running nemesis. For someone who’d seen the game’s trailers of a tomahawk wielding assassin engaging in revolutionary wars and fighting his way across the natural American landscape, having to spend several hours in slow paced tutorials as a bourgeois colonist came across as a confounding misdirect to say the least. You can see where the initially hostile reaction to Assassin’s Creed 3 stemmed from, then, and Hutchinson admits this is something he would have changed had he been involved in the upcoming remaster. But there’s a reason players are beginning to look back on Assassin’s Creed 3 more fondly. It is, after all, responsible for introducing us to naval combat, which has gone on to become a fan favourite staple feature of the series, and is even the basis for Ubisoft’s upcoming standalone seafaring title Skull & Bones. While Assassin’s Creed: Black Flag was the game to really go to town with the pirating simulation, Hutchinson is proud to have been involved with its origins, and is somewhat regretful that the team didn’t make better use of it throughout Connor’s story. But would Hutchinson actually have taken the opportunity to work on Assassin’s Creed 3 Remastered had Ubisoft called him up? After working on Far Cry 4 and the now cancelled Pioneer (“The last thing I did was that little bit in Watch Dogs 2, that’s the closest anyone will get to see of that game as I imagined it”), the developer has since left the mammoth publisher to found his own creation house, Typhoon Studios, and he’s too busy looking forward to think about what could have been. He has, however, been keeping up with the Assassin’s Creed franchise as a player, calling the last two games (Assassin’s Creed Origins and Assassin’s Creed Odyssey) “fantastic evolutions of the franchise’s identity.” Hutchinson is now working on a new adventure game, Journey to the Savage Planet, at Typhoon Studios, which he admits is a “radically different” kind of development experience to devising the next installment in an established franchise at Ubisoft. "We were seeing a lot of new players who’d never played Assassin’s Creed before." Before my conversation with Hutchinson came to an end, I had to ask him one last question about Assassin’s Creed 3: What happened to the canoe? The much hyped traversal mechnicac featured heavily in promotional screenshots leading up to the game’s release, but was nowhere to be seen in the final product. Interestingly, that canoe screenshot appeared for a short time on the store page for Assassin’s Creed 3 Remastered too, before being quietly removed after Ubisoft must have realised it was still a small case of false advertising. Whether the canoe ends up in the game or not, Remastered is another chance for Assassin’s Creed 3 to make its case, this time without the disadvantage of following up Ezio and a hyperbolic media blowout. Hutchinson himself intends to pick up the game and reacquaint with his contribution to AC universe later this month, and I’d recommend anyone previously turned off by Connor’s instalment to do the same. You might be surprised by what you find. Find out where Assassin's Creed 3 comes on our list of the best Assassin's Creed games of all time (so far).